Given the production involved, independent war films are something of a rarity. Director Ryan Little made Saints and Soldiers on a shoestring (1/140th of the budget of Saving Private Ryan). Second World War reenactors volunteered as extras and most of the equipment and props came from private military collections. The film begins with the infamous Malmedy Massacre, where German soldiers opened fire on unarmed prisoners, and follows four American GI escapees as they make their way across Belgium, back to Allied occupied territory. Early on they come across a British pilot who happens to have some vital intelligence in his possession, lending a greater sense of urgency to the proceedings. Clearly lacking the financial resources to compete in terms of set-pieces and battle scenes, Little has chosen to take on the competition in the arena of authenticity. Everything has been exhaustively researched, from the uniforms and guns down to the underwear the soldiers wear. 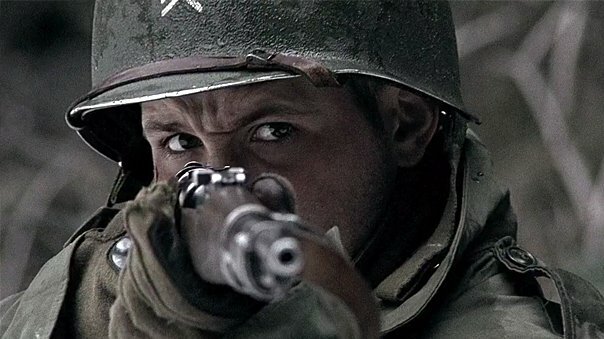 Saints and Soldiers is billed as the most authentic war film ever made. It’s clearly a labour of love, which why it’s a shame it’s ultimately a rather lacklustre affair. While it might provide an interesting paragraph for a film student penning an essay on mis en scene, the vast majority of the audience won’t care less if the lettering on a ration box matches its 1944 original or not. And unfortunately, in all the areas audiences generally do care about – characterisation, plot, action, thrills – Saints and Soldiers is found lacking. The group of characters we follow across the Belgian mountains are a collection of clichés. There’s the steady, dependable sergeant (Peter Asle Holden), the cynical New Yorker (Alexander Polinsky), the dumb hick with his heart in the right place (Larry Bagby) and the man of God on the verge of a crack-up (Corbin Allred). But worse than any of the GIs is Flight Sergeant Oberon Winley (Kirby Heyborne), the most horrible cinematic representation of an Englishman I’ve seen in a long time (and that’s including Richard Curtis films). The dialogue they pass between them is flat and uninspiring. Tired talk of life back home, girls, the insanity of war; the likes of, “What am I doing here? I should be back on the ranch winking at Marie-Jean and milking the cow!” – you’ve heard it all before. While the props may be recycled from WWII, the screenplay seems similarly rehashed from almost every Second World War film ever made. It’s a sad irony that it’s not the miniscule budget that lets Saints and Sinners down, it’s the fundamental components of the film itself. And then there’s the message. Little graduated from the Brigham Young University (a Christian institution) and the film has a strong sense of Christian morality lurking just below its surface. This mainly finds expression through the central relationship between Gould (Polinsky) and Deacon (Allred). Despite being a medic, Gould exemplifies the “I’ll look out for number one” attitude; of course, he’s also an atheist. He conflicts with Deacon, a former Mormon missionary in Berlin, mocking him for his faith and his sympathies with the Germans. Over the course of the film, Deacon, through self-sacrifice and bravery, wins Gould over to the extent of converting him. Only then can Gould see the enemy as fellow human beings. The implication being that such enlightened empathy is only possible through Christianity. Such rhetoric would be forgivable if sugar-coated by a genuinely interesting film. But Saints and Soldiers is little more than a fairly bog-standard representation of events as they unfurl. There isn’t a single sequence that offers anything new or unexpected. It could have been made 50 years ago and, had it been, only die-hard film buffs and WWII enthusiasts would remember it now. Behind the scenes documentary; director commentary.